The hunt for a specific Easter Egg in Halo 3 began in 2012 when a bungie.net user that goes by the name of "Its A Mirage" asked a question for Bungie's mail sack. The user asked a question to the participating employees of the mail sack regarding Easter Eggs. One of the employees, Jon Cable, replied to the question confirming there are undiscovered Easter Eggs still out there. "Its A Mirage - Are there any Easter eggs from your past games that surprised you at how quickly they were found or any that surprised you at how long they took to find?" "Definitely the IWHBYD skull in H3. But you cheated. There is one Easter egg in Halo 3 that I don't think anyone has found - I stumbled across it in code a while back. It only happens on a specific day...so good luck. After seeing that response members from the Bungie/Halo community tried to find the Easter Egg but had no luck tracking it down. In a later mail sack (no link available) another bungie.net user asked a question for the Q&A. "What is your proudest moment in your time at Bungie?" "Showing my wife the Easter egg I put in the halo 3 loading screen for her - the one that nobody has found yet. This time there was a hint to where players may find it, on the loading screen in Halo 3 on a specific date. For two years nobody had found until yesterday when a video was uploaded to Youtube by user "Lord Zedd"
The date when the Easter Egg would appear is December 25th and on the Halo ring in the loading screen had a message along the side of it saying "Happy Birthday Lauren! ", Lauren is Adrian Perez's wife. Lord Zedd was able to find it by changing the date while offline on his Xbox to the required date. So there you have it, the hunt for famous Halo 3 loading screen Easter Egg is now over and can now be added to the long list of Halo 3's discovered Easter Eggs and Halo overall. Leave your thoughts on this discovery below. Bungie is set to update Halo PC and Halo Custom Edition so that it's online multiplayer support will continue following Gamespy's closing. Bungie has announced that developer Roger Wolfsen, along with a small group of fans, have been working to keep Halo PC online following Gamespy's shutdown. "A small group has been quietly preparing for the shutdown of the GameSpy Master Server (which provides the list of Halo servers) and they are finally ready to discuss their work. The group consists of Roger Wolfson aka Sawnose (of Bungie), Btcc22 (of HAC2), Kornman00 (of OpenSauce) and myself, Technut (of PÕQ Clan). As a result of their work, especially Btcc22 and Roger, Bungie will be releasing version 1.0.10 of Halo PC and Halo CE soon, which will include the fix for the Lobby!" The update will ensure steady, reliable servers for Halo PC players to continue playing online multiplayer. Bungie will be releasing this update soon. What do you think of this news? Does it surprise you that Bungie is taking the steps to ensure that Halo PC stays online? Leave your thoughts in the comments below. Special Thanks to our Community Moderator, Church for showing me this news! The Destiny Beta has been confirmed to kick off in July according the Activsion/Blizzard first quarter report. The Beta for Destiny is coming in July, two months before the official release date as the report shows but no full date for the beta release has been given yet. There are speculations that it could launch on Bungie Day (July 7th) which is pretty safe to assume as it is Bungie's own annual festivity and what better way to celebrate it than launching the Beta on that day. But whatever the date is Playstation fans will be first to play it as Bungie announced last year that the Playstation will get early access to it. It is not yet confirmed how long Xbox fans will have to wait for it to come to the Xbox 360 and the Xbox One after it releases on the PS3 and PS4, it could possibly be something along the lines of a week or so. To gain access to the beta you have to pre-order the game to receive a code at participating retailers where you then enter it over at bungie.net. So are you going to be participating in the beta? Are you getting the game at all? Bungie presented us with a new video of gameplay from Destiny yesterday. The video didn't really stand out all that much from what Bungie has shown us before over the last number of months in terms of gameplay. But there are some things that may be worth pointing out and discuss about, certain things that could raise a few questions regarding the lore. So while we wait or hope for something new to see at E3 let's see what interesting we can divulge from the latest video that could be of interest. So first up after the opening with the Bungie and Destiny logos the video quickly snapped to a cutscene of a squadron of Guardians in their personal ships, racing through the sky to commence a strike mission against the Fallen and Hive in Old Russia. As you can see from the picture we can get a good idea of how much detail and options are available for customizing our personal ships. The three ships are very different from each other, they are completely different in shape and have quite a difference in size and colour from each other. This image seems to tell us that we will be to choose from a variety of types or models of ships and of course, as expected, give them our own coat of paint. The video then fades to a map of a part of the Solar System showing the Earth, the Moon, Mars, another planet that appears to be Venus and The Traveler. The words that are placed between the planets may raise some questions. We can see the word "Tower" beside The Traveler and just before the screen shot was taken as the video was fading from the three ships to the planets the word "Reef" was above The Traveler and between the two other planets and a word that spelled "Crucible" to the right of the Earth. Now the "l" and "e" of the word are not seen in the shot as the video was blared at that moment as the video was changing scenes. So why are these words placed on the map? Could they be names of the controlled area's in space that the Guardians still have in their power? Here we have another map but it is only of the Earth this time. If you look at the shape of the land and the way it borders with the oceans, you will see that it is completely different from how it is today in the real world. Has the sea level risen? Has the continental plates shifted that much in as little as seven hundred years? That one is doubtful but who knows, it is a video game after all anything is possible. It will most likely be a big question fans will discover the answer to when they play the game. Again we have another map of different locations that border one another and makes up the place or a part of a plce called "Old Russia". The locations that surrounds The Devils' Lair are called King's Watch, Rocket Yard, Gateway, Blind Steepes, Delta South (I think), Moth Yard, Sky Watch, Dry Sea and along there is Forgotten Shore. These will possibly be all explorable locations in the game. So has any of this got you thinking about what you will discover in the game? Bungie has just released a new Destiny gameplay video titled "The Devils' Lair" as it follows a team of guardians fighting their way through the depths of Old Russia. In this seven minute long video we see a Fireteam of Guardians on a strike mission beneath the ruins of the Cosmodrome in a location called "The House of The Devils' Lair" in Old Russia as they take on the Fallen and the Hive, two of five enemy races Humanity will battle against to save Earth and their colonies. Destiny is a completely online game that encourages team play with co-operative modes that involves raids and strike missions as it is shown in the video. This has been the first proper video of solid full length gameplay since Bungie's presentation at last years E3. Fans itching to see more Destiny content will surely be tied over until more of it returns in just less than two months at this years E3. What did you think of the new gameplay, are you looking forward to the game? Branching Out While Getting Back to Their Roots. For those who have not yet heard about its unveiling yet, undr zid (Affiliate, Admin of ForgeCafe), has finally released his shiny new baby to the public as of April 18th, 2014. This was the 5th anniversary of the ForgeCafe's existence dating back to the days of bungie.net. DestinyCafe has been in the works for over a year according to undr zid and his very helpful Cafe Staff had been helping him all while keeping it under wraps all this time. Some nice features on the site include its Streams tab where you can catch Twitch Streams of anyone you follow that has a Stream on site, the Clans system which allows you to essentially be an admin of your own sub-forum in a way, and its nice clean look. DestinyCafe is of course a Destiny forum but welcomes any other game fans as well. Being on the testing team months prior to its launch, I did get to see some changes and it's amazing how fast undr zid and his Staff can work. There are already some familiar faces there from ForgeCafe's harry_c0 and OxK Nym to our very own -Sparky- and Silent Orbis. Congratulations undr zid and I hope your sites do well with both titles launching this year. Thank you for letting me experience the site as it was changing. Hope everyone gives it a try and it is another Cafe so there might be coffee. Bungie has come out and stated that despite controversy surrounding Marty O'Donnell's departure from the company, his music will remain in Destiny. ​We received quite the depressing surprise on April 14th when we had the news broken to us that our beloved composer Martin O'Donnell had been terminated by Bungie. In an interview with people at Eurogamer.net, Pete Parsons said that Marty's magnificent work on the project would remain in the game, and that fans shouldn't worry about the game's soundtrack or the game itself's features. He had said that the game was, "close to shipping" and that he believes "the Bungie fanbase is going to look forward to hearing Marty's music, Mike Salvatori's music, C. Paul's music and Paul McCartney's music in the game," acknowledging that while polish still needs to be done, most of the game is complete and in it's finished state, just needing a shiny coat of paint to top it off. While Marty's departure is melancholy news, most did fear it would impact the majority of their experience in the game. 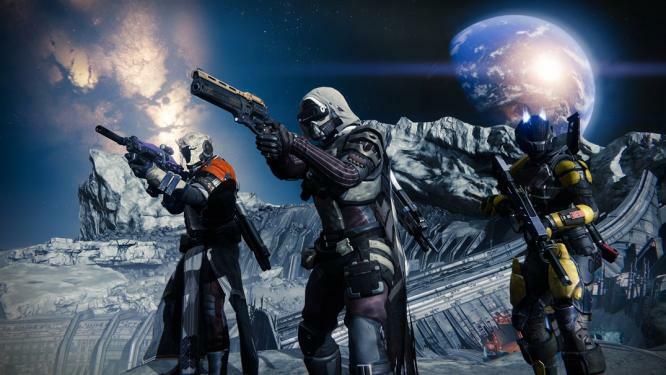 Now we know that isn't that case, but are you still as excited to play Destiny? Let me know below, thanks for reading! Yesterday Marty O'Donnell the composer and audio director at Bungie made a post on his twitter account announcing that he has been fired from the company. He states that his duties at Bungie had been terminated without cause on April 11th. No reason has yet been announced why he had to step down from his roles and departured from Bungie. Although something about this does seem suspicious, could this be a late April fools joke? Marty O'Donnell is a veteran employee at Bungie and has created a huge fan base due to his music for the Halo series. If this is indeed true and not a sick and twisted prank then this will no doubt come as a blow to many in the Bungie community especially with their new series Destiny is in the works. What do you think about this news? Do you think it may be a prank or is this the end of Marty at Bungie? Bungie has not yet commented directly on the matter or if they even but they have left a farewell message to Marty O'Donnell on the news page of their site. The messages reads; "For more than a decade, Marty O’Donnell filled our worlds with unforgettable sounds and soundtracks, and left an indelible mark on our fans. Today, as friends, we say goodbye. We know that wherever his journey takes him, he will always have a bright and hopeful future. That is all Bungie has officially commented on the matter but according to a reddit user claiming to be a Bungie employee he or she says that the reason for the termination of Marty's position at Bungie was a dispute over pay. "Okay. So I can't give out too much detail here, but I will let you know what I know. Marty was a contracted employee, he didn't just get a fee for each game he produced. Marty had received a significant raise in the last few years, but was now asking for another. This created tension between him and the board (some of whom already felt he was overpaid). A verbal argument ensued recently between Marty and a member of the board. Shortly there after he was let go. So there was certainly 'cause' but one that a lot of us felt could be worked through. But money talks. The board feels they can get someone for cheaper, and without the drama, that will have a better ROI." I highly doubt this person is genuine, the thread this anonymous source created on reddit has been deleted for failing to privately identify his or herself to the moderators after claiming he or she would do so. I wouldn't advise anyone to believe this and be wary of any other statements that may arise . Here is a link to the reddit thread just to show it has been removed. In Bungie's latest podcast there has been a mention of competitive multiplayer map's "These maps are specifically designed 100 percent from the ground up to be awesome for competitive multiplayer," Competitive multiplayer design lead Lars Bakken said. Despite Bungie showing major elements of sociable gameplay and features it appears Bungie is definitely bringing competitiveness among players to Destiny. We will possibly see a range of competitive game types and maps. "We are going into an interesting space, where we are a shooter, we are an action game, we are a game that a lot of people out are really familiar with and they love and they spend a lot of time playing and we are trying to bring some additional elements to that." He also says, "The goal is so that you have this game that you come back to and that your friends come back to, and when you're all coming back to the game, and you all feel like you want to keep playing this game. Then you have a social game at that point. You actually have a cooperative experience, a community experience." According to Lars Bakken the skill you use within Destiny will "go beyond thumb stick abilities and quick fingers" you must understand on how you equip yourself and look at the choices you make. It has been confirmed Bungie will have a place at this years Game Developers Conference to talk about their new game Destiny GDC's news blog announced. According to their schedule Bungie will have two appearances at the conference their sessions titled "Building Customizable Characters for Bungie's Destiny" and "Designing the Bungie Animation Workflow." There are brief descriptions on what these session will be talking about, their first one being about customizing characters "Destiny's player customization system is highly ambitious and unlike anything seen in a first-person shooter thus far." GDC stated. In their other session Bungie will be going into more of a technical aspect of the game showing things like how they create and animate characters as the description says. "We'll break down what it means to animate an immersive character performance, with a focus on efficiency, and Bungie's high quality bar. ", "We'll demonstrate our process and our findings by giving you a behind the scenes look at our secret Bungie sauce." The Game Developers Conference is set to run from March 17th - 21st in San Francisco but the dates for Bungie's talks have not yet been announced but we'll know more on that as we approach closer to the commence date of the conference. Game Informer visited Bungie to sit down with co-founder Jason Jones to talk about Destiny. In this interview Jason answers a lot of questions and gives a lot of insight to the game, he gives us some more on Destiny's Story, talks about solo and competitive multiplayer and tells us why they moved on from Halo to create this new universe. I will provide the first part of the interview below then will give links to the remaining parts as it is a very long interview. 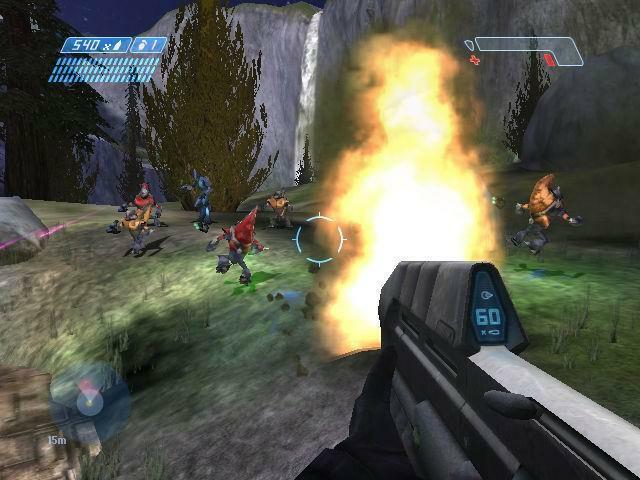 Before Destiny, your team had been working on Halo for a long time. What prompted the move? Did you feel like you were ready for something new? I think the situation made part of the decision for us. We’d been with this one IP for a long time and you want to try something different. You have ideas. I think the genesis of new projects for a lot of people here (certainly for me) is being out in the world and playing other games, seeing other entertainment. In the best way, being a critic and saying: “There’s an opportunity here that I want to see, that I want to play. When I experience these other games, I don’t get. That really drove Halo 1, this idea that shooters are great. I love shooters, but they’re complicated. There were all these opportunities in shooters that we wanted to see. I think that’s really the genesis of Destiny. They’re not the same opportunities, because those have been in existence for a long time, but when you look out at the shooter experiences on consoles there’s a lot of great stuff – great action experiences, but they’re only starting to scratch the surface of cooperative play, aspirational goals, player-player interaction – whatever you want to call it. Having a world that feels like a real place that you visit instead of just a way to play competitive. If your question is: Where does this project come from? I think part of it is the way all of it comes, which is this desire to participate in some experience that doesn’t exist yet. So that’s what we’re trying to build. We’re trying to build a game that we have wanted to play that doesn’t exist. Early on did you have the idea for this integrated cooperative and competitive campaign? Was that part of the genesis or did that come later? Absolutely. That was right at the beginning. There are games in which the idea that you start to play the campaign, and you’re immersed in some world and you think it’s cool and you’re investing yourself in some kind of building and some story and some character and then you want to play cooperative or you want to play competitive and it’s a whole different progression, sometimes on a different disk, sometimes a different executable. There is this tremendous opportunity there that you can see in other genres. It makes you feel like you can play competitive for two weeks and then come back to playing some cooperative experience, and you actually help yourself. Your character was better, can go more places, do more things. Right away for sure that was one of the huge opportunities that we saw. It’s frustrating in a good way, because I’m enjoying these games that I’m playing, but it’s frustrating because I’m enjoying this game and then to play with my friends I have to do what? There’s a whole new kind of progression that I’m not able to take back. I wanted it to be different. Your team was coming off of the decade of a franchise about a sci-fi character who’s got big armor and guns and shoots aliens. Is it just that you and the team really love science-fiction? What brought you back to the genre? I would say that this place we’re going it is exciting to me. It’s different. There’s more – there’s so many bad ways to say it – sci-fantasy. There are guns and tanks and spaceships and travel between other worlds, but there’s also dens of wicked creatures living under the Earth with awesome s--- you can go get, take from them, and bring out and make yourself more powerful – that’s more of a fantasy bit, and I think it was really appealing to bring that kind of mystery and adventure into the shooter. It’s a different approach from the heart of the military, which I think we have a lot of in console gaming right now. I’ve played all the shooters in the last two or three years. We thought we could bring something new to that, which is the idea: yes to the science and yes to the space ships, but there is also wonder and mystery and adventure. We could out on the frontier and see good fortune and it meant something. In the way you would in a fantasy game. That is hugely appealing to me, and to us. And another one of the opportunities that we wanted to take advantage of that would have been difficult with a previous IP. 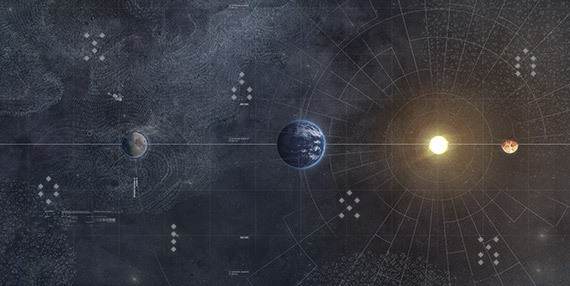 What you eventually got to was this detailed world-building idea of the Traveler, the last city, and the solar system as a setting. Where did that begin? Game stories are really unique, because you want a world that’s compelling to be in. It’s the first pillar of Destiny. The world that players want to be in – it can’t be repugnant or push you away or be some place you don’t want to return to. I think I can enjoy those worlds for a while and I think there are games that I play that have totally compelling worlds that are awesome to visit, but some place that you want to live in that you want to return to for weeks and weeks in a row. One of the things that we wanted was to build a world that was welcoming. Full of danger and mystery and horror, but to have it – you can see in the concept art – be at the same time beautiful and compelling and interesting, and draw you into that. In coming up and trying to find this story that we wanted to tell, I had a bunch of stuff just written down, archived, notebooks, ideas for stories that I think would be great for a more linear media like a book or movie or something like that. Game stories need to be so different from more linear stories. They need to support, in our case, multiple protagonists acting over a long time. They need to supply with you with an endless stream of evil to fight hand-to-hand over and over again. And there are some stories that just don’t sustain that. I said two things there. One of them is we wanted a really welcoming world even if it was very dangerous and in some cases full of horror. And the other thing was that we did on the way is push to the wayside a bunch of stories that just didn’t give us this feeling. Our very first metaphor was a candle in darkness, or Camelot in the middle of the untamed frontier. There was a place you could go that you could be safe, put your feet back, and look out over a sunset. I’m being totally metaphorical here. Interact with other players. You can trade stuff. Buy s---. I knew on all sides you were surrounded by the wicked frontier, the adventure, the mystery. We built a bunch of different stories like that, but we were trying to create something big that we can build in. A world that was going to let us live in it for a long time – that was going to let us tell a lot of different stories. A world that was actually okay with us telling stories that were great instead of turning away stories that were great – if that makes sense. There were a lot of great video game worlds that can only tell one kind of story. We wanted to get away from that. 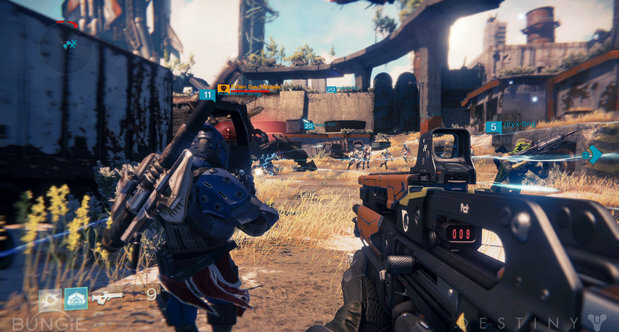 At PS4 release yesterday, Bungie showed us another peek into their new and expansive world. and possibly another hint at some multiplayer. pieces of info that we got out of this new trailer. Lets here what Above Infinity from GoBeyondEnt has to say about it. and it is a lot at that. new moves/trump cards or is it seeing that cool zero G fight scene? Leave your comments below and thanks for reading. Video game journalist and video game show host Geoff Keighley has made a post on his twitter page that a new exclusive look at Destiny will be shown tomorrow at 11pm ET along with an announcement from Bungie. As you can see from the twitter post no specific details regarding the exclusive look and Bungie's announcement has been given. 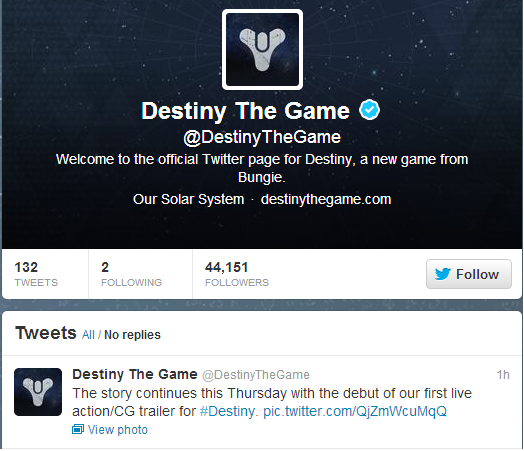 I personally think Bungie's announcement will be the release date for the beta or the game itself, or possibly both. So stay tuned tomorrow for a new Destiny reveal and announcement. Bungie has given out Destiny codes to the community to unlock certain things in the game, it is unknown what these codes unlock at the moment as it tells you to check back in 2014 to see what you have unlocked. Here are the codes and they have each been given name that relates to the game, so this could be a hint what the codes give us, possibly some kind of exclusive access to weapons, armor etc. It is unknown that if the unlocked contents can be used in the beta but more news will probably surface regarding that. These codes and be redeemed at this site http://www.bungie.ne...r/redeemedcodes and they can be used by everyone so it is not first come first serve. If you're like me, then you've probably watched the PS4 Destiny reveal video a hundred times, looking for any detail you may have missed the first time you watched. Watch AGAIN as 3 of Bungie's artist add their commentary to the video as it progresses. 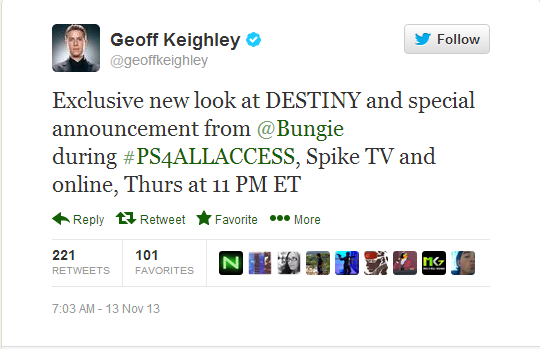 of any new revelations of Bungie's upcoming title Destiny!! This information includes audio played at Blizzard's massive multimedia main stage. Now sit back, relax and listen to new audio found in Destiny by Martin O'Donnell and Michael Salvatori! Repeating patterns and signals enfold us day and night and in all ages. Unmoved mover that moves all others. Inclining from heaven towards the Seven. New music heard so deeply that it is not heard at all. This was Bungies first E3 presentation in 3 years and we finally got to see some destiny gameplay. Below are videos of gamelay, trailers and interviews. A tweet from Destiny's twitter page confirms that a live action trailer will be shown this Thursday, no specific time or place has been told where to view the trailer yet but we might get an update on that pretty soon. The link in that comment brings us to this image, it could possibly be a script or a document that tell explains how the trailer will play out. You can see the words "Law Of The Jungle" printed, this could tell us that the trailer will be set in a jungle area on Earth or on of the planets in out solar system.